Cutting down on processed sugar can be tough (we get it, black coffee is not for everyone). But scoring the health benefits of going sugar free doesn’t have to make your life any less sweet. Meet, your new BFF: Natural Delights Medjool dates, the non-GMO fruit that will seriously satisfy your sugar cravings (they’re called “nature’s candy” for a reason) but are loaded with the health benefits that are notoriously lacking in processed sugar. Medjool dates have more polyphenols (the free-radical fighting antioxidants) than blackberries, plums, and apples, and more potassium by weight than bananas (hello, post-workout fuel! ), making them a superfruit in their own right. Unlike processed sugar (i.e. white sugar, brown rice syrup, cane syrup, and corn syrup), Medjool dates won’t spike your blood sugar levels. On the sugar front, Medjool dates are the smarter option because of the way your body breaks them down. Unlike processed sugar (i.e. white sugar, brown rice syrup, cane syrup, and corn syrup), Medjool dates won’t spike your blood sugar levels. Because of their high fiber content—12 percent of your daily fiber per serving—your body breaks them down slowly, giving you a sustained release of energy without the dreaded sugar crash. Medjool dates make great snacks on their own, but they can also be transformed into a syrup or paste for a sweetener that’s low on the glycemic index, so it won’t cause the pesky inflammation that regular sugar does. Three cheers for living the sweet life (in the healthiest way possible). Scroll down for two Medjool date-based recipes that are bound to become your go-to sugar substitutes this summer. 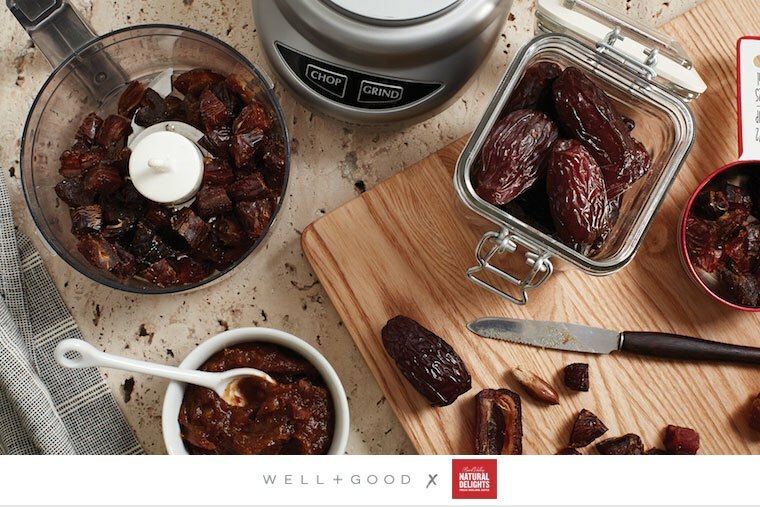 Medjool date syrup is as versatile as your favorite shiny black leggings. Use it to dress up your cocktails for GNO, or to drizzle over nice cream for a girls night in. You can also mix it into iced coffee or tea, or tap it to enhance BBQ sauces and marinades. For step-by-step instructions, check out this handy video to see the recipe in action. 1. Bring water and Medjool dates to a boil in a large pot. Then reduce heat and simmer, covered, for 1 hour, stirring occasionally and pressing dates with the back of a spoon. 3. Set aside for 1 hour to drain. When cool enough to handle, gather excess cheesecloth at the top and twist tightly to enclose Medjool dates. Squeeze firmly to remove as much liquid as possible. 4. Pour liquid into a medium saucepan and bring to a boil. Reduce heat to medium-low and simmer for 30 to 40 minutes or until mixture has reduced to just slightly over 1 cup, stirring frequently. As mixture reduces, lower heat and stir frequently to avoid scorching. Syrup will thicken as it cools. Enter: Your new favorite toast topping. Spread a thick layer of Medjool date paste onto a piece of whole wheat bread, sprinkle some nuts and berries on top, and you’ve got a sweet and savory breakfast that will (probably) make you reconsider your relationship with avocado toast. You can also swirl it into oatmeal or yogurt for more lip-smacking breakfast options. 1. Place Medjool dates and water in a food processor. 2. Process until fairly smooth to make a coarse paste, or process longer to make a creamy paste, scraping down the sides if necessary. 3. Store tightly covered in the fridge for up to one month.